The original mechanical frequency-readout is always wrong. It is a gear-driven mechanism tied to the PTO tuning shaft. It only "predicts" the frequency the receiver is supposed to be tuned to. There are several sources of error that cause it to be wrong. The first-converter uses a 17MHz crystal which is never exactly 17MHz but differs by a slight amount which is a normal, allowable manufacturing-tolerance. The second-converter uses a bank of crystals to enable band selection. Each crystal differs from its ideal frequency by a small percentage which is a normal manufacturing tolerance. This "error" is different for every crystal and every associated band. This is the reason why the R-390A must be recalibrated after every band switch. 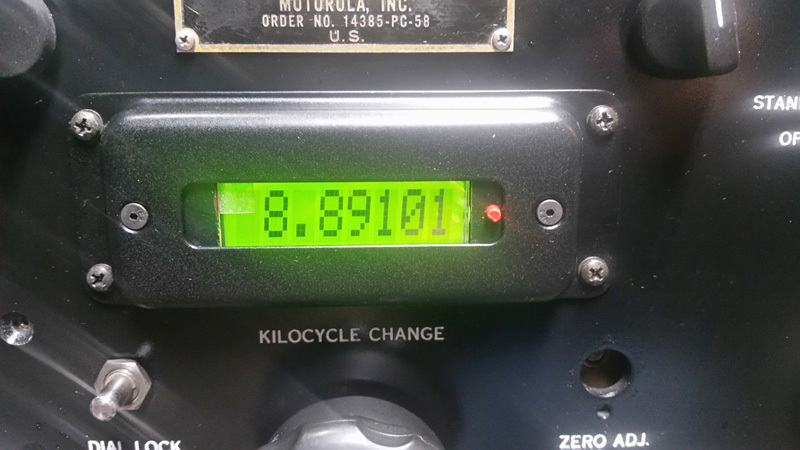 The receiver's 100KHz crystal calibrator is used as a work-around method to accomodate these and other sources of error. Even after recalibration there are still errors causing the mechanical readout to be inaccurate. The PTO is unavoidably nonlinear, although the nonlinearity can be minimized with careful adjustment during overhaul. The nonlinearity can never be totally eliminated and it increases with age until eventually the PTO cannot meet its specification of maximum allowable nonlinearity. The PTO's endpoints must likewise be adjusted during overhaul and with age all PTOs eventually exceed their endpoint adjustment tolerance. The BFO is not included in the mechanical frequency readout. Thus, when the BFO is turned on it does not affect the indicated frequency. This is a problem during SSB tuning, as the indicated frequency does not reflect the frequency of the SSB signal that is tuned in. 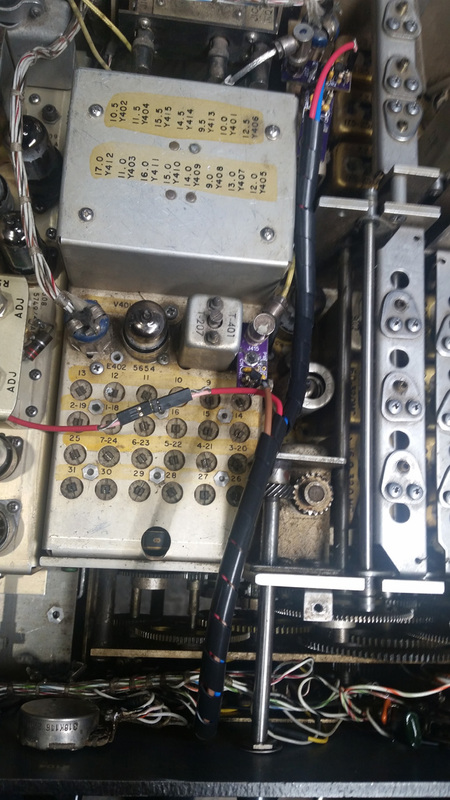 All of the mechanical readout's errors can be avoided by replacing it with an electronic readout that is driven by a frequency counter system that continuously measures all the frequencies used in the receiver and uses them to calculate and display the actual received frequency. The output of the counters is displayed on an LCD display which is updated approximately 4 times per second. This update rate allows two more digits to be displayed than the mechanical display had, i.e., resolution is now to the nearest 10Hz, 100X better than before. Even with 100X improved resolution there is still no need for the R-390A's original recalibration scheme. With this new, counter-based system, the only source of error is the single, common time-base for the four counters. The time-base is a temperature-controlled and compensated crystal oscillator with long-term stability of 2ppm per year. This oscillator is adjustable to reduce initial error to zero. A pushbutton is provided to enable reading the BFO frequency. Pressing the small red button at the right end of the LCD readout, changes the counter system to display only the BFO's frequency, for as long as the button is pressed. This enables positioning the BFO accurately within the passband of the selected mechanical-filter. This facilitates optimizing the BFO frequency setting for interferance and noise conditions. Everything is fully assembled. It just needs to be installed in the R-390A. Only two connections are soldered. The wires from the original panel lamps are unsoldered and spliced onto a small power-cable (supplied) which will be plugged into the main PCB. All other connections are coax. Three small boards mount onto the three coax BSM jacks, J415, J221 & J217. These small boards are buffer circuits which sample the oscillator signals without loading them or reducing their amplitude. The main PCB has the LCD on it and the microprocessor/counter circuit. This board is already mounted in a freshly-painted bezel/escutcheon. You just need to remove the original bezel/escutcheon and the Veeder/Root mechanical display, to make room for the new ones. You can save your original parts in case you ever want to restore your receiver to original/unmodified-condition. Copyright © 2011 - 2016 David M. Allen. Unless otherwise noted, all content on this website belongs to the site-owner. No person, corporation or other legal entity is permitted to make use of this content in any fashion or for any use other than personal use, without the express written permission of the site-owner except for fair use provisions as allowed by appropriate copyright law. See website Terms & Conditions. Content contained in offsite links belongs to their respective owners.